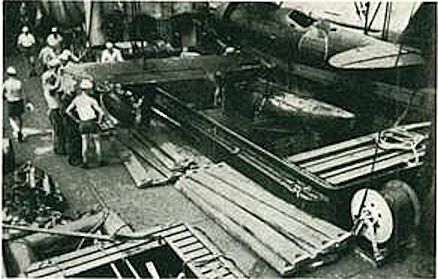 I’ve gone down a real rabbit hole since reading for the first time the story of an E8N “Dave” purchased by the Germans from the Japanese for use on one of their commerce raiders. My original post is here. Since then I’ve done a bit more readings and research. It appears that a second Dave may have been purchased, but there is some question as to whether or not it was used. This is allegedly a photo of the second Dave aboard the German ship Thannenfels. Here is the post on the Arawasi blog with that story. So far the only photo of the Dave in British markings on the Orion is the one that was in my previous post. The serial number painted on the aircraft L5196 is said to actually be a serial for a Fairey Battle and was a reference to the seaplane unit on the Orion. In addition, it appears that one other German commerce raider used an aircraft in British or South African markings. In this case, a German He-114. A mention of this is in this article. In addition, noted Australian aviation author writes in an article that an He-114 from a German commerce raider overflew Port Adelaide, though what markings it carried are unknown. For more on German commerce raiders in the Pacific generally, see this article. I am officially hooked. If anyone knows anything else on this subject, or has any pointers to any interesting photos, let me know.